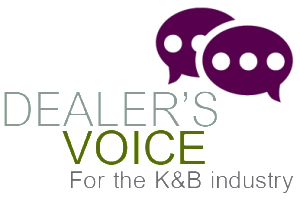 The Dealer’s Voice, Vendor’s Voice and Consumer’s Voice are the premium places for Kitchen & Bath Industry content and information. By joining the community you get free access to TONS of great content that you can’t get anywhere else, including our trademark 4M Sales Training. Join the Dealer’s Voice Community! The Kitchen & Bath Industry’s Best Resource to Help you DOMINATE your Market!